2007 Washington International Horse Show wrapped up Sunday, Oct. 14. Black Ice and Jill Henselwood (Canada) soar to victory in 2007 $100,000 Gerald R. Ford President's Cup Grand Prix. Tina Dilandri, riding Chanel 292, wins Senator's Cup and is named 2007 Junior Jumper Champion. 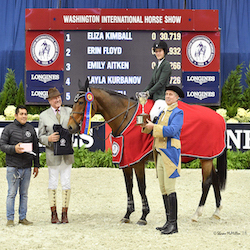 The Washington International Horse Show, a 501(c)(3) non-profit organization, announced today new events and entertainment slated for the October 9-14, 2007 show. WIHS announced today that it will donate 700 tons of the arena footing to the Mounted U.S. Park Police.